Japanese auto giant Toyota is the largest automaker in the world by revenue. They have annual revenue of more than $265 billion, edging out German counterpart Volkswagen. If you were to take one trip around your local mall or favorite grocery store parking lot, it would instantly be clear why. Toyotas are everywhere, and a new Toyota car, truck or SUV is probably sitting in your neighborhood driveway right now. And sooner than you think, that new Toyota car, truck or SUV could be sitting in your driveway. Toyota currently offers more than 40 vehicles around the world, from subcompact cars to utility vans and everything in between. Perhaps you are in the market for a new Toyota Corolla, one of the best-selling vehicles of all time, having sold more than 40 million units. Maybe you tend to lean on the eco-friendly side and want a Toyota Prius, the first ever mass-produced hybrid vehicle. Or you could be looking at longevity, in which case you will want the Toyota 4Runner, one of the longest lasting SUVs ever manufactured. Whatever your individual driving needs and preferences are, a new Toyota is just the right fit for you. Take a look at these three vehicles and see which one fits you best. When you are done, head on down to Joseph Toyota and get a look at these incredible vehicles in person. The 2019 Toyota Corolla is full of the reasons why it has sold more vehicles than the current populations of all of Ohio’s neighboring states combined. 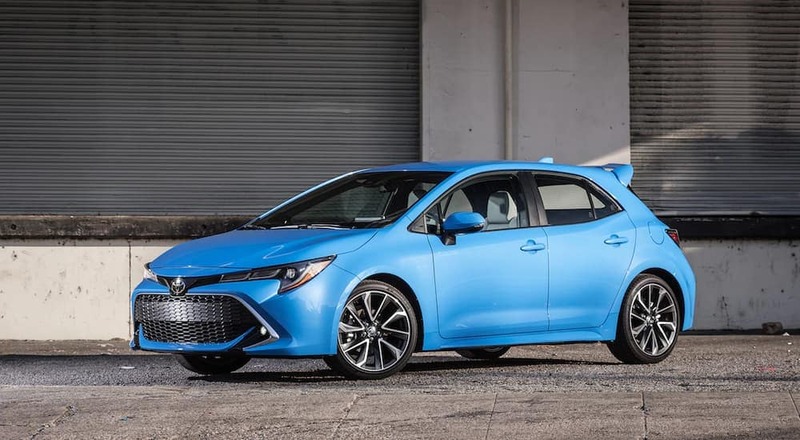 Starting at $18,700 the 2019 Toyota Corolla has six different trim levels to choose from, making this one of the most versatile and customizable sedans on the road. If you prefer the hatchback version, the 2019 Toyota Corolla offers that, as well. The hatchback will also offer an 2 trims so you can customize this vehicle however you need. The top trim level, the XSE CVT, comes with an inline 4-cylinder engine, capable of 132 horsepower and 128 lb-ft of torque. However, Corolla buyers would be far more interested to know that it gets an astounding 35 miles to the gallon on the highway. That is some of the best fuel efficiency available in a fully gasoline-powered engine. This trim level also comes with Android Auto and Apple CarPlay. These services allow you to connect your smartphone to its infotainment center and have instant access to your own music, podcasts and navigation. Among the safety features, you will find a backup camera, Stability Control, Traction Control, Lane Departure Warning and Lane Keep Assist, among others. These safety features serve to help keep the driver aware of his surroundings at all times, as well as complete control of the 2019 Toyota Corolla, even under adverse conditions. The top trim level of the 2019 Toyota Corolla, the XSE CVT, starts at only $22,800. With all of the safety features, infotainment access and versatility it offers, especially at such a low price, it is easy to see why the Toyota Corolla is one of the best selling vehicles of all time, and promises to remain at the top of the list for years to come. Part of the appeal of the modern sport utility vehicle is that it combines the comfort of the sedan and the utility of a pickup truck. SUVs such as the 2019 Toyota 4Runner handle that task with ease, and offer some of the best interior room on the SUV market, to boot. The 2019 Toyota 4Runner seats up to five and has the interior spaciousness to do so very comfortably. The front row offers 39.3 inches of head room and 41.7 inches of leg room. That is plenty of space for even Toyota drivers on the tall side. The rear seat offers 38.6 inches of head room and 32.9 inches of leg room, still more than adequate for a comfortable ride. If you are one of the SUV drivers that uses your ride for more of a utility vehicle, the 2019 Toyota 4Runner offers plenty of interior space for cargo. Behind the second row is 47.2 cubic feet of storage space. When the second row is folded down, the interior volume nearly doubles to 89.7 cubic feet of space. In total, the 2019 Toyota 4Runner has 144.5 cubic feet of interior volume. Whether you are the frequent driver in the carpool or you do a lot of grocery shopping, the 2019 Toyota 4Runner has the interior space to get you and your cargo where it needs to go. Starting at $34,910, the 2019 Toyota 4Runner comes in seven trim levels and eleven total configurations, making it yet another highly customizable new Toyota vehicle. In recent decades, concerns over the earth’s environment have raised serious questions as to the carbon footprint we leave on this planet. One of the most vilified industries is the auto industry. Cars and trucks have been putting out pollutants for more than 100 years, ostensibly causing severe damage (“catastrophic”, as Al Gore might say) to our planet and atmosphere. In the early 1990s, governments around the world got together to figure out what they could do to curb those effects. Long story short, one of the most revolutionary developments to come out of those meetings was the Toyota Prius. Introduced in 1997, the Toyota Prius was the first mass-produced electric-gasoline hybrid vehicle in history. In the 20+ years since it has gone on to become the best selling hybrid vehicle around the world and lead the revolution in clean energy cars. The 2019 Toyota Prius continues the tradition of helping save the planet one tank off gasoline at a time. There are actually three Prius models available – the Prius, the Prius c and the Prius Prime – and a total of twelve trim levels to choose from. All of them range from a low end of 43 miles per gallon on the highway (both Prius c trim levels highway miles) to a staggering 58 miles per gallon in the city (Prius Two Eco). Different models and trim levels will come with either a nickel battery (metal, not the five-cent coin) or lithium battery. Between the battery performance and the fuel efficiency, the 2019 Toyota Prius models will be able to go more than 600 miles without refueling and/or recharging. For decades, the Toyota Prius has done more than its fair share to save the planet. Starting at only $23,770, and saving you tons of money at the gas pump, this groundbreaking hybrid will save your bank account, as well. Of course, Toyota has far, far more to offer than just the three vehicles mentioned here. This is but a small sample size of the huge inventory of new Toyota cars, trucks and SUVs for 2019. If you would like to see these vehicles, and more, in person, come down to Joseph Toyota in Cincinnati today and see these beautiful vehicles in person. Our sales staff can answer any questions you have about any of these vehicles, as well as the other used or new Toyotas on our lot. We can set you up with a test drive so you can see the power, spaciousness and technology for yourself. Our finance department can walk you through all the steps of financing, buying or leasing. Our service technicians can set you up with a maintenance schedule so your new Toyota runs for years to come. If you’re looking for a Toyota we look forward to meeting you!